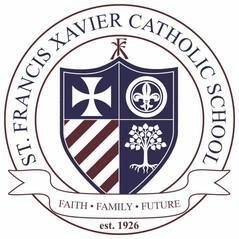 As a Roman Catholic school, St. Francis Xavier is dedicated to creating an environment in which a Christian way of thought and life permeates all facets of the educational program by focusing on the spiritual, moral, intellectual, individual, social, physical, and cultural growth of its students. Spiritual Development: Faith development, personal prayer and group worship are an integral part of the curriculum and student life. Students and faculty are afforded opportunities to develop and participate in individual and communal expressions of the Catholic faith. Moral Development: St. Francis Xavier School imparts the rich traditions of the Catholic Church, providing instruction in faith, morality, decision-making and ethics in conformity with Catholic doctrine. Intellectual Development: The purpose of the curriculum is to provide each student with the academic skills necessary to gain entrance into an appropriate high school and the basic skill necessary to function in a complex society. Taking into account the varied abilities of its students, this school also offers many and varied courses and services to meet the intellectual needs of its students. Individual Development: Students are encouraged to become aware of their gifts and limitations, realizing that there will always be greater or lesser persons than themselves in their lives. The school strives to instill self-esteem, self-realization, self-reliance, and self-responsibility. Social Development: The school provides ample opportunities for students to experience and learn cooperation and concern for others according to Christian and acceptable norms. Rules and regulations are formulated to instill an awareness of self and others as part of the larger community and to develop a respect for legitimate authority. Physical Development: The school provides a variety of experiences for students to recreate, exercise and compete within and outside the school community to develop a healthy attitude toward their bodies. Physical education, health, nutrition and exercise are available to its students. Cultural Development: Through a variety of on- and off-campus activities, students are exposed to experiences relating to the arts, culture, proper decorum and their heritage as members of this city, state, nation and world, with an emphasis on the appreciation of the varied and diverse nature of the world in which they live.